El Chico will be holding a fundraiser for Brevard ASAP on Tuesday, February 16th from 5pm to close. 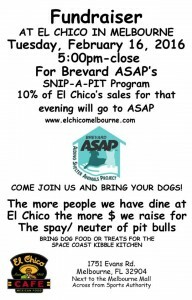 10% of El Chico’s sales for that evening will go to Brevard ASAP’s SNIP-A-PIT Program. Please help us get the word out to all pet lovers in the Greater Space Coast area! The more people we have dine at El Chico on the 16th, the more money that goes to help spay/neuter Brevard County pit bulls. Please also bring dog/cat food to be donated to Space Coast Kibble Kitchen (Brevard County’s 501c3 Pet Food Pantry). Click image below to view details, get directions and more.